Enabling Jumbo Frames on Windows Server 2012 R2 using PowerShell and on Cisco 3560G using IOS commands. | Chinny Chukwudozie, Cloud Solutions. Jumbo frames are Ethernet frames with a payload greater than the standard mtu of 1500. Increasing the mtu size on a 1 GB network usually improves network performance and efficiency.The following PowerShell cmdlets will help display and check current jumbo frame values and edit them.The maximum value of a Jumbo frame on an Ethernet adapter varies depending on the network adapter brand. I completed the same configuration on the remaining team NICs.To optimize performance on the network and take full advantage of this configuration, the next logical step in the process is to configure the corresponding Cisco switch port for Jumbo frames. L3Switch(config)#system mtu jumbo 9000 ? This entry was posted in Jumbo Frames, Network, Powershell 4.0 and tagged Cmdlets, Jumbo Frames, Network Adapter, PowerShell 4.0. Bookmark the permalink. 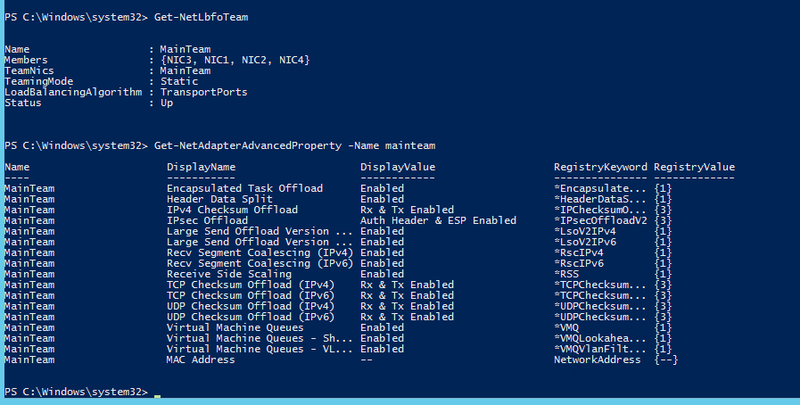 2 Responses to Enabling Jumbo Frames on Windows Server 2012 R2 using PowerShell and on Cisco 3560G using IOS commands. on average, percentage wise, how much of an increase in perf do you see from enabling jumbo frames? On average, approx what percentage of perf gain do you see by simply switching to jumbo frames?